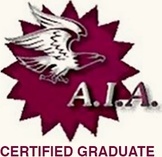 As a graduate of the Asheford Institute, the school has provided you with an Asheford approved, "Graduation Seal Of Completion" (similar to the one showing on the left), which can be placed on your website to indicate to customers and clients alike, that you have successfully completed the Asheford Institute Of Antiques professional-level program on antiques, collectibles and appraising. This seal of completion also demonstrates that you're a "graduate member" of the school and that you have satisfactorily completed all required tests and examinations from the Institute. Below, you will find various options on how to display the seal on your website. If you have any difficulties or need help setting-up this seal on your website, call the Admissions Office toll free at: 877 444-4508 and a representative will be happy to assist you. If you prefer to "copy and paste," you can use the example of the animated GIF or static jpeg below to copy and paste the image of the seal onto your website. If you would like the Institute to email you an "attached" file of the animated Graduation Seal, please contact us at: asheford@mail.com and include "Graduation Seal" in the subject line. If you do not wish to use the animated version of the Asheford Logo. You can copy and paste this "static" version. PLEASE BE ADVISED THAT USE OF Asheford Institute Of Antiques TRADEMARKS, LOGOS, AND GRAPHICS, EITHER IN PRINT, OR IN ANY OTHER MEDIA, INCLUDING, BUT NOT LIMITED TO WEB SITES, DOES NOT CONSTITUTE AN ENDORSEMENT FROM THE Asheford Institute Of Antiques. THE DISPLAY OF Asheford Institute Of Antiques TRADEMARKS LOGOS AND GRAPHICS BY GRADUATES MAY ONLY BE USED TO CONVEY COMPLETION OF THE Asheford Institute Of Antiques PROGRAM, AND DOES NOT IN ANY WAY CONFER AN ONGOING ASSOCIATION OF PROFESSIONAL STANDARDS (ETHICAL OR OTHERWISE), ADDITIONAL TRAINING, OR ANY CONTINUING EDUCATION STATUS OR RECOGNITION FROM THE Asheford Institute Of Antiques. THE Asheford Institute Of Antiques MAY NOT BE HELD LIABLE NOR ACCOUNTABLE IN ANY WAY WHATSOEVER FOR THE CONDUCT AND ACTIONS OF INDIVIDUALS OR ORGANIZATIONS WHO USE, POST, OR DISPLAY THE TRADEMARKS, LOGOS AND GRAPHICS OF THE Asheford Institute Of Antiques ON THEIR WEB SITES OR ANY OTHER RELATED MEDIA. 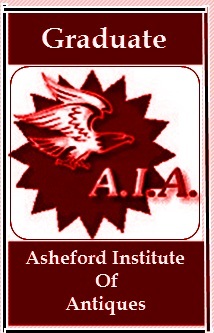 IN ADDITION, THE Asheford Institute Of Antiques MAY NOT BE HELD LIABLE OR RESPONSIBLE FOR ANY DIRECT, INDIRECT, PUNITIVE, INCIDENTAL, SPECIAL, CONSEQUENTIAL DAMAGES OR ANY DAMAGES FROM THIRD-PARTY DISPUTES THAT MAY ARISE IN REGARD TO THE USE OF Asheford Institute Of Antiques TRADEMARKS, LOGOS AND GRAPHICS. FURTHER, THE Asheford Institute Of Antiques IS NOT RESPONSIBLE AND MAKES NO REPRESENTATIONS ABOUT THE SUITABILITY, RELIABILITY, AVAILABILITY, TIMELINESS, AND ACCURACY OF THE INFORMATION, SOFTWARE, PRODUCTS, SERVICES AND RELATED GRAPHICS CONTAINED ON THE Asheford Institute Of Antiques WEB SITE FOR ANY PURPOSE. TO THE MAXIMUM EXTENT PERMITTED BY APPLICABLE LAW, ALL SUCH INFORMATION, SOFTWARE, PRODUCTS, SERVICES AND RELATED GRAPHICS ARE PROVIDED “AS IS” WITHOUT WARRANTY OR CONDITION OF ANY KIND. Asheford Institute Of Antiques HEREBY DISCLAIM ALL WARRANTIES AND CONDITIONS WITH REGARD TO THIS INFORMATION, SOFTWARE, PRODUCTS, SERVICES AND RELATED GRAPHICS AND LOGOS, INCLUDING ALL IMPLIED WARRANTIES OR CONDITIONS OF MERCHANTABILITY, FITNESS FOR A PARTICULAR PURPOSE, TITLE AND NON-INFRINGEMENT.